"I have to consider whether I want to be a czar or head of the Federal Reserve, and I'm toying with the idea of which one to take," Ron Paul joked on "The Tonight Show" Tuesday. 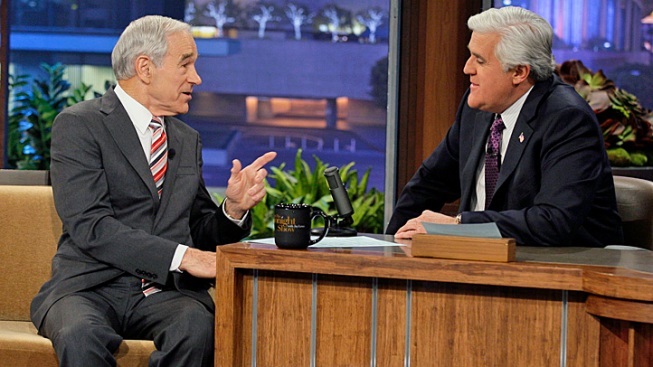 The GOP's perennial long-shot presidential candidate Ron Paul explained to Jay Leno Tuesday just why he might not be such a long shot after all. The Texas Congressman is the only of the four GOP rivals never to have been considered a front-runner for the nomination in the topsy-turvy race, but he explained on "The Tonight Show" Tuesday why that's not going to end his run. With the race still so undecided, Paul is hoping for a brokered convention, and he told Leno why with an explanation of what a brokered convention means. Although on the first ballot the delegates are committed to a candidate based on primary results, if nobody wins on the first vote, those commitments don't hold for subsequent votes. "Then they can vote their conscience. Then, I believe, we'll get a lot of those delegates," Paul said. As for speculation that Paul, who famously wants to do away with the Federal Reserve, has some sort of secret deal with rival Mitt Romney? Maybe for some sort of political favor or high-profile appointment? "I have to consider whether I want to be a czar or head of the Federal Reserve, and I'm toying with the idea of which one to take," Paul joked. "And then you can eliminate your own job," Leno retorted. Paul also had some harsh words for his rivals — all three of whom he said should drop out of the race. Check out the clip below.